If your dog is an equal member of your household, wouldn’t that mean that he deserves his own towel? Aside from the matter of equality, it will also make drying your pet a lot more convenient. 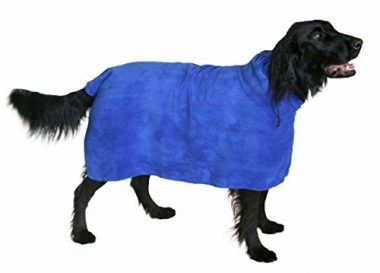 Their coat can be tricky to dry after a bath, but thanks to specially designed dog towels, that task will become effortless. Now that you have set your mind on buying one of these products, the question of what is the best dog drying towel remains. That is why we made a top 10 list of quick dry towels that your pooch might like. Make sure to also read the buying guide that will answer all questions you might have on the issue. There is a wide variety of reasons why microfiber should be your material of choice for dog towels. 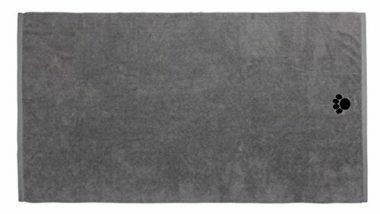 The fact that it absorbs water quickly is at the top of that list and that can clearly be noticed in the Microfiber Pet Bath Towel by Bone Dry. You do not have a long time after your Fido’s bath to dry him up because you risk his coat getting smelly from the water, especially if you are dealing with furry dogs. Fortunately, this microfiber dog towel will allow you to dry your pet quickly while he enjoys you pampering him. The material used is extremely soft, which means that your pooch will feel comfortable while you are drying him. It is not difficult to maneuver the towel as microfiber is lightweight and it will allow you to use your hands without hassle. The dimensions of the towel are 44 inches x 27.5 inches and it is available in twelve different colors. Our personal color choice would be taupe as it is neutral and you are guaranteed that your dog won’t repel the towel because it looks weird to him. 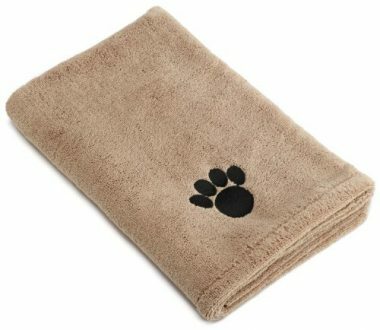 The paw print on the item will make it clear that it is your pet’s item when you wash it in the machine with other towels. It is interesting to mention that Zwipes was the company that first introduced microfiber towels to the US market. Today, they are still manufacturing these items and they make them at an affordable price. If you compare it to other products, you realize that you will get two towels from Zwipes at the same price that the other manufacturer would charge you for one. That doesn’t affect the quality as this definitely belongs to the group of quick dry towels. They measure 30 x 36 inches, which makes them big enough for large breeds. 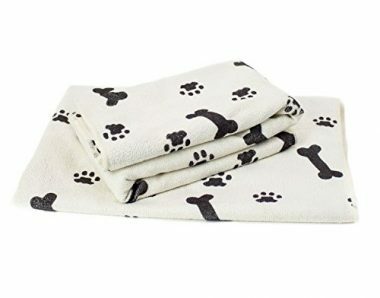 We also loved the design as it combines the intriguing color with black paw and bone prints so that it is clear that the towel is intended for your pet. 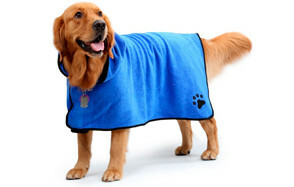 The product is suitable for drying, grooming, and even when you want to keep your Fido warm. Each of the towels can be washed in the machine and the quality of microfiber secures extended duration of the product. The only thing to make sure is to take care of them in accordance with the manufacturer’s instructions. Forget about cotton towels that take an eternity to dry your pet and easily get filled with water. Instead, you want to check out the Pet Towel for Dogs and Cats by Furinator. The material of choice might seem weird at first as the manufacturer went with PVA synthetic. However, once you see the efficiency of this towel for the first time, you will realize that they made the right choice. It would be nice to mention that the product is also environmentally friendly since the material is biodegradable. They say that it is always smart to check out the customer reviews and they have a lot of nice things to say about this item. The towel is incredibly lightweight, but it can absorb a lot of water – roughly about 10 times more than it weighs. That secures you a dog drying towel that won’t take a bunch of your time until you finish the job. PVA is resistant to bacteria, but you still need to ensure to wash it regularly. The problem is that you cannot use a washing machine, but need to do it manually with soap and water. Fortunately, there aren’t a lot of spots where debris and hair can be trapped and the smooth surface ensures that you will clean it in no time. Let us tell you a thing or two about hand pockets, which might be the most important feature of the Super Shammy Beige Microfiber Chenille Dog Towel by Soggy Doggy. If you have a large pet or one that doesn’t listen, drying him can be a stressful job. However, utilizing hand pockets will enable you to have better control of the towel, which will secure that you can thoroughly wipe your Fido in just a minute or two. Next, let’s talk about the material of the towel, which is made of microfiber chenille. This shammy towel can absorb plenty of water and it’s only its size that might make him unsuitable for large dogs. It measures 31 x 14 inches, which is ideal for small and medium breeds. Despite this small flaw, you won’t resist when you notice the beautiful design and impressive aesthetics of this item. It comes in four colors, but we have no doubt that it is beige that you want. We do not know if this is the best dog drying towel for your needs, but we know that it is incredibly easy to keep it clean. Just place it in the washing machine and it will be as good as new in no time. If we are talking big dog towels, we have to mention Dog Towel by YOUYUN which is impressively large at 55 inches x 27 inches. If you have a big baby pet that loves to be pampered, you cannot go wrong with this product. It is not a pure microfiber dog towel considering that it contains 80% polyester, but that doesn’t affect its effectiveness. In fact, you will be surprised that this item will exceed your expectations. It will leave no residue on your pet and, at the same time, it will not trap fur. This will not make it simple to clean the item as you can feel free to put the towel in the washing machine with your other things. The design of the product is classic with gray being the dominating color and its durability could be improved. However, you get a 1-year warranty, which means you will use the towel for at least 12 months or get a free replacement. 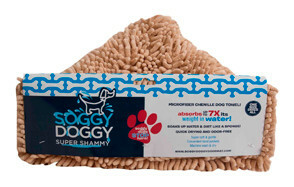 Dirty Dog Shammy by Dog Gone Smart might be the best shammy towel that both you and your dog ever tried. First of all, let us get one thing straight – this item is small. It is a square-shaped towel with 10 x 10 inches in size, which means that it is perfect for taking it wherever you go. It was portability that the manufacturer had in mind as a primary concern and they managed to make an extremely portable towel for your dog’s needs. 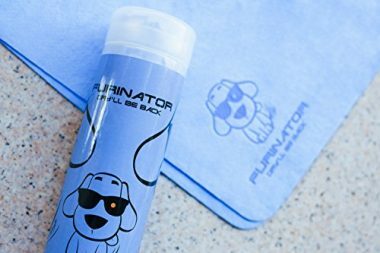 Whether you are heading on a vacation and taking your pet or you simply want to spend a day at the beach – this will be the ideal helper for drying your pooch. 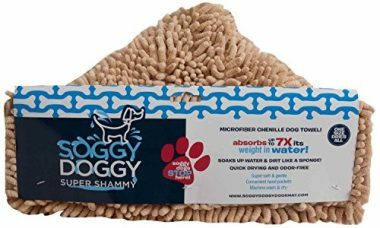 The product is entirely made of microfiber chenille which can absorb 20x more water and dry your dog eight times faster than a blow dryer or cotton towel. The process is accelerated thanks to dual hand pockets which will enable you total control over the item. Once you are done, you just need to put it in a washing machine and then use a dryer to get the towel dry and ready for the next bath. Just as an added bonus, the product is made in the shape of a bone and it comes in attractive brown and gray colors. Don’t be repelled the first time you see the price of this microfiber dog towel. Keep in mind that this is the largest size available and this is the biggest towel on our list. With its back length of 29”, it is suitable for medium and large breeds. In an intriguing turn of events, you can let your dog dry himself with this product. You have the option to wrap the towel around his waist and tighten it on his belly. It will be an instinctive reaction from your pooch to try to get the item off him. By the time he finishes, there is a good chance that he will be almost entirely dry and you will only have to finish the job. You shouldn’t neglect another advantage of this dog drying towel. If your pet just went running in the rain, you can wrap this up around him afterward to keep him warm and prevent a possible cold or another health issue. 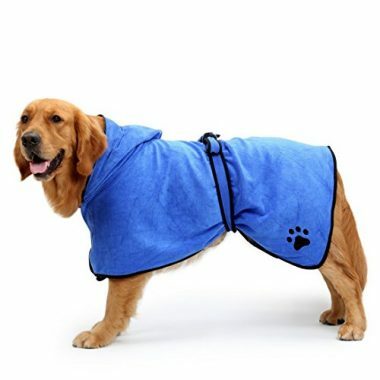 The towel comes in blue color and a design that reminds of a bathrobe, which is combined with the paw print just to confirm who it belongs to. 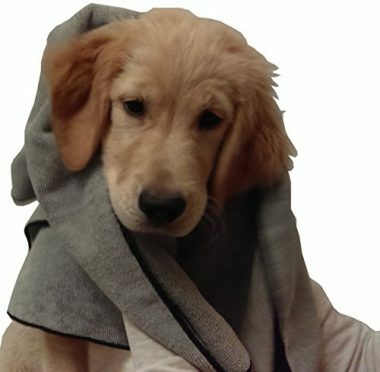 Easy Wear Dog Towel by the Snuggly Dog is another in the line of dog robes that double as quick dry towels. They are available in two colors – blue for males and red for females (or vice versa) and you can select between four sizes depending on your dog’s breed. You won’t find many manufacturers that specify the density of the microfiber used in their products. Here, the company proudly states that is 400gsm, which is more than the most similar items you find in the market. This is important information because it indicates how absorbent this product is. In fact, it might be the best dog drying towel on our list as long as you like the design. Aside from the towel, you will get a belt that you can use to wrap the product around your pet’s body, which will make him feel like other members of his household after a bath – warm and cozy. You can also adjust the product around your pet’s neck and tail so that you make sure everything fits snuggly. The manufacturer is so certain in the quality of the product that it will provide a complete refund unless you are satisfied with how it works. However, keep in mind that the product is a bit pricey when compared to other dog towels from our top 10 list. We like to see that you can choose from several different sizes, but we do not like the fact that the biggest towel offered by DRI is 55 inches x 28 inches. That doesn’t mean it is not big enough for large breeds, but it does imply that it could have been bigger. You can also pick from four colors, but we selected grey as it is universal and fits both males and females. When it comes to performance, it does just what you would expect from a microfiber pet towel. It secures quick drying of your pooch as it instantly absorbs water. During the process, it will probably also pick up debris and dirt that wasn’t removed during the dog’s bath and help you clean his paws from the mud. Not a lot of people like to go through a hassle of keeping their dog towel clean and that is understandable. Fortunately, the entire process of maintenance with the Ultra Absorbent Microfiber Pet Towel involves throwing it in the washing machine and turning it on. The product is foldable, which makes it suitable to take on travels or anywhere you go with your dog. 2-Pack Microfiber Pet Bath Towels by Microfiber Pros is the final one on our list of quick dry towels for your dog. This is a bargain deal as you would get two towels at an affordable cost, but are they worth anything? The answer is yes as you can expect each of the items to last for at least 100 uses. You might wonder why would you need two, but the truth is that this product has multiple purposes. Aside from using it as a microfiber dog towel, you can use it as a mat for your dog or even as a car seat cover. The important thing is that there are no chemicals so there is no danger of irritating your pet’s skin. Each of the towels measures 40 inches x 20 inches, making them suitable for various dog breeds. Thanks to its ample ability of absorption, large pets can also be cleaned with this product. As for the towel, you can wash it in the machine, but it is advisable to hang dry it to extend its duration. Now that you know what our suggestions for the best dog drying towel are, let’s focus on the things you need to consider when choosing your favorite. The preferred material for most manufacturers is microfiber, which doesn’t mean other materials can’t do the job. However, microfiber is incredibly absorbent and it can absorb a lot more water than cotton towels. The density determines how effective a microfiber towel is in absorbing water and you should look for models that have at least 250-300 grams per square meter. Consider the size of your dog and choose the towel for him accordingly. The truth is that you cannot go much wrong here because medium towels may be suitable for all breeds with the only difference being that they take a bit more time to dry large dogs. The only thing you want to make sure is that you do not get a towel that is too big for a small breed and vice versa. It is a bit different when it comes to towels that double as bathrobes. In that case, you need to consider the back length and ensure that they are long enough to cover your pet and keep him warm and cozy. The good news is that the process of maintaining dog towels doesn’t require a lot of effort. However, you have to ensure that you act exactly as it says in the instruction manual that comes with the product. The majority of dog towels are machine washable, but there are some models that need to be washed with soap and water. The situation is a bit different when it comes to drying, which is why you need to read the instructions carefully. In most cases, you can use a dryer as long as it is set on low heat, but some items must be hung dry so that the product doesn’t get damaged. A: Yes, you can, but it probably won’t be as effective. Towels for humans are usually made of cotton which doesn’t have near as much ability to absorb water as microfiber. Q: Will it dry my dog faster than a regular towel? A: Yes, that is one of the main reasons why we use them. Dog’s coat is different than human skin, which is why specially designed towels are needed for quick drying. Q: How long will a dog drying towel last? A: It depends on the model and how often you use it, but an average lifespan should be about a year or 100 washes, whatever comes first. It was hard to pick the best dog drying towel as there are some excellent products on our list. However, it’s the Microfiber Pet Bath Towel that managed to beat the competitors just by a dog’s nose. This item has everything you could ever ask from for a pet towel. First of all, it will secure that the process of drying your dog when he gets wet is efficient and smooth. Second, the towel has enough density to absorb plenty of water in a short span of time and ensure that your pooch is completely dry. The product will not get smelly from the water and it will not trap hair, but one thing matters more than that. 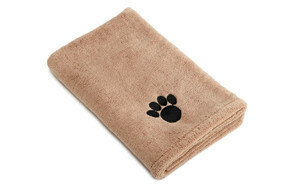 It is the comfort of your pet since he will enjoy being pampered while you are rubbing its body with this towel. 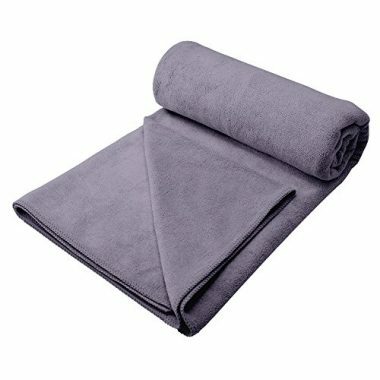 The towel is medium-sized with dimensions of 44 x 27.5 inches, which makes it suitable for all sorts of breeds. At the end of the day, you cannot go wrong with any of the towels from our list, but if you are buying a dog towel, why wouldn’t you purchase the best of the best?